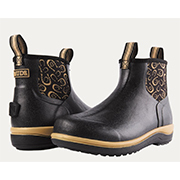 Dublin Lifestyle boots: Keep your feet dry and comfortable. Waterproof leather boots from Dublin with fashion and a great footbed to keep your feet happy on course walks, dog walks, rainy days, and chores. MUDS Boots from Noble Outfitters® keep your feet warm in the winter, and cool in the summer, with comfort and quality a top priority. Horseware® Rambo® boots, a new style for this season! Fashion meets comfort. 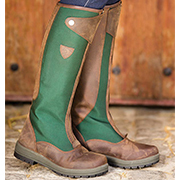 Shires Rockfish Wellies over top of the line waterproof protection with sacrificing comfort. The Broadway boots are a stylish zip up classic.